Love it or hate it, Starbucks is the biggest name in coffee, especially if you’re in the United States. It may not make the best cup of coffee you will ever taste, but there’s probably a Starbucks within walking distance of wherever you are reading this, and there’s something to be said for that. Right now, you can make your coffee addiction pay, with Amazon offering an extra $5 Amazon credit when you buy a Starbucks gift card of $25 value or higher with the special code at checkout. The deal is apparently good for any qualifying gift card purchase through February 15th 2019 and will be applied to your account within three days of the Starbucks gift card being delivered. If you’re a coffee lover who also likes to buy from Amazon, this is a deal that you’re not going to want to miss. To get your free $5 Amazon credit, buy Starbucks vouchers of $25 or more from here and enter offer code SBUX at checkout. There’s a lengthy list of terms to be aware of, though. Purchases must be for at least $25 of select Starbucks Digital Gift Card (“GC”) value, and the GCs must be purchased in a single order at Amazon.com. Offer does not apply to other Starbucks products. 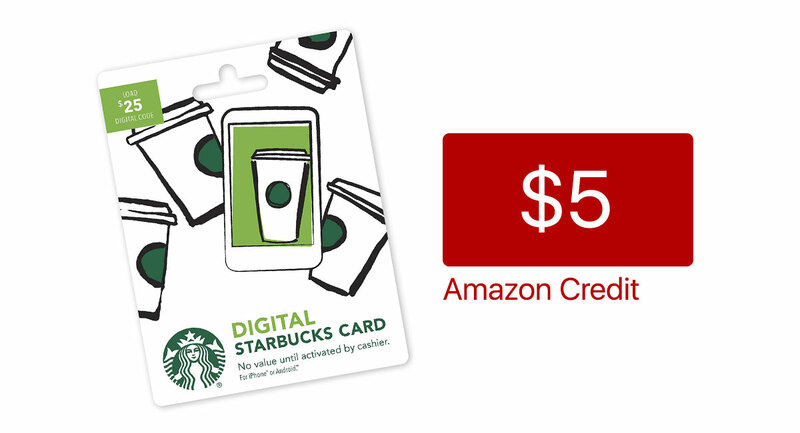 Offer only applies to $25 or more of Starbucks Digital gift cards sold and delivered by ACI Gift Cards Inc., an Amazon company. For qualifying purchases, the promotional credit will be automatically applied to the Amazon.com account used to make the qualifying purchase within three (3) days after the qualifying order has shipped. A confirmation email will also be sent to the email address associated with the Amazon.com account used to make the qualifying purchase. Promo Credit is valid through and expires on February 15, 2019, 11:50 PM (PT). Limit one Promo Credit per customer/primary email address. With that said, it’s time to buy some coffee!